Tramp Harbor is an unusual anchorage on the east side of Vashon Island. The harbor is mentioned in the cruising guides, but not with a glowing recommendation. The anchorage is open to the north and southeast, but makes a good stop when winds are calm or from the west. 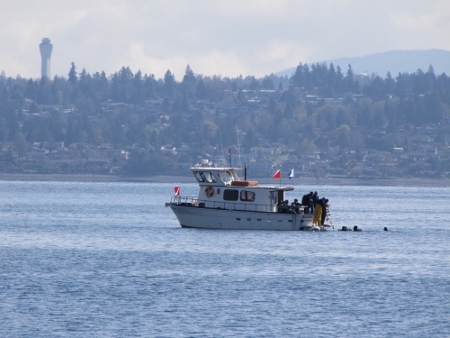 Southwest winds can blow over the isthmus between Maury and Vashon Islands, but the anchorage is so close to shore that the fetch is minimal and the boat simply moves a bit at anchor. We’ve overnighted there comfortably during gale-force southwest gusts. Our first few visits were in the winter, when winds are generally from the south, so we originally anchored close to southwest shore. 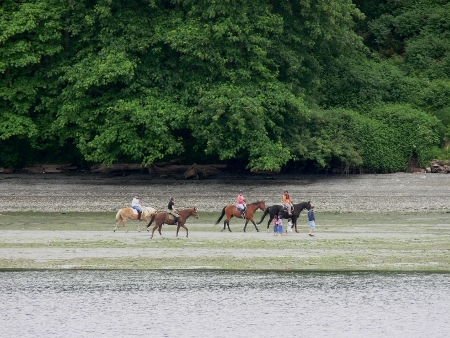 Low tide there brings the residents out to beach-comb and horse-back ride. Recently we’ve been visiting in the summer, and anchor off the northwest shore, with better protection from the prevailing summer northerly winds. The nearby fish haven attracts scuba divers, who arrive in groups on charter boats to explore underwater. 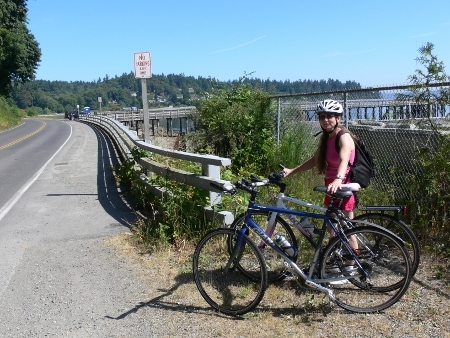 The area around the narrow strip of land between Vashon and Maury islands is called Portage. Before the land-to-land connection was built, the neck carried water-to-water traffic between Tramp Harbor and Quartermaster Harbor on the other side. 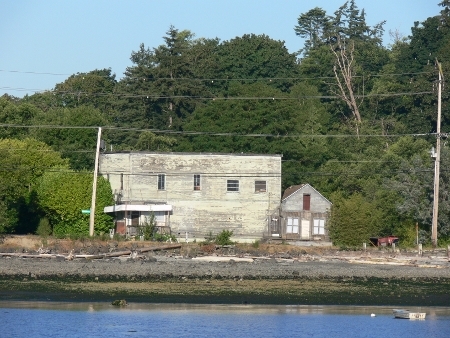 The distinctive two-story building visible ashore is the now-closed Portage Store. The store was established in 1903 and operated for a century. 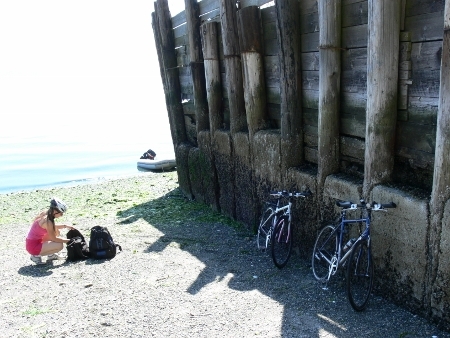 The charted pilings in front of the store are the remains of the old dock where the Mosquito Fleet landed. 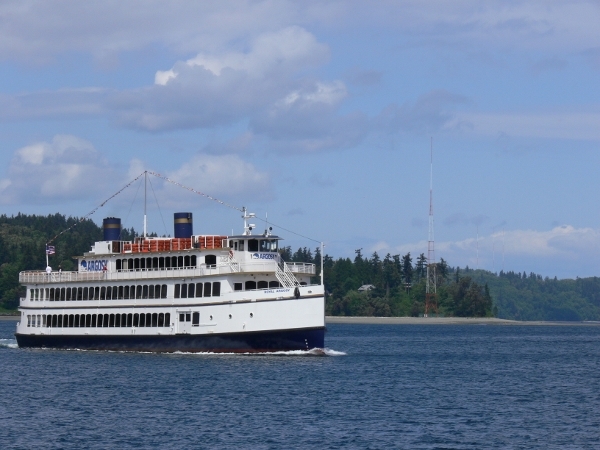 These ships supplied regular passenger and freight service to Puget Sound communities from 1850 to the 1930s. Reminiscent of those historic vessels, the Royal Argosy on occasion makes a long slow pass through the harbor and around our anchored boat. Nearby is what we have dubbed the “Portage Fitness Club.” When we last visited the area, old broken-down exercise equipment was strung along the road facing Tramp Harbor. 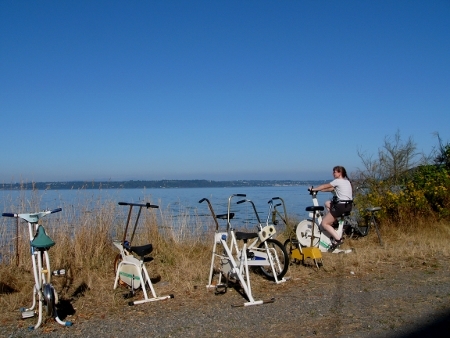 You won’t get much exercise, but you couldn’t ask for a workout with a finer view. Just south of the fishing pier, a walled abutment makes a good dinghy landing point. We’ve taken the bikes ashore there for an island tour. 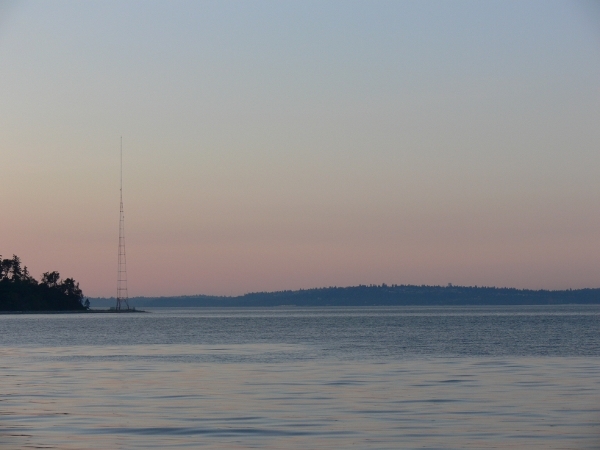 The anchorage is a light show in the evening: against a backdrop of light from Vashon Island and the mainland, six different radio towers on Vashon Island flash within sight and a constant stream of planes land and take off at Sea-Tac airport across East Passage. Anchoring notes: For good southwest protection, anchor in 3-5 fathoms directly north of the three King radio towers shown on Chart 18448. Better northerly protection is in 6-8 fathoms south of Point Heyer and west of the fish haven. That’s way more clever than I was epxcetnig. Thanks!